“The plants I planted for you this spring.” Obviously, I hadn’t been handing out in the herb garden recently. 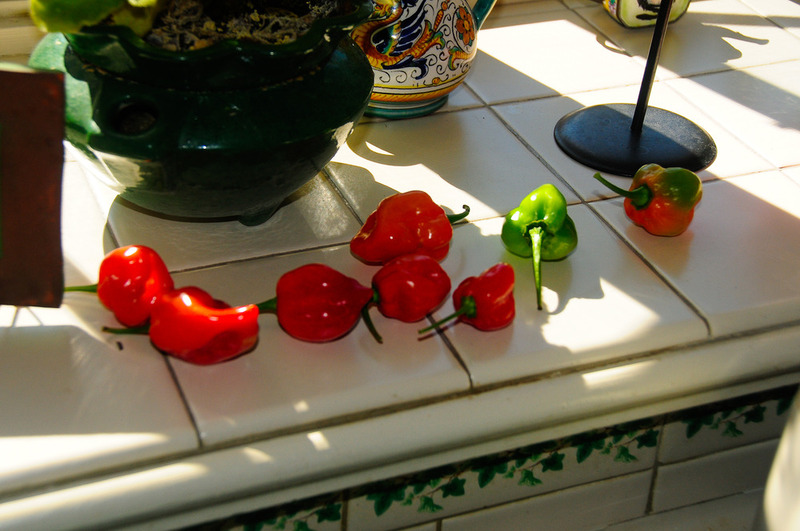 Then I went out to “the back 40” and not only were there pepper plants but 2 habanero plants with 30 pieces of fruit each. So since then I have been trying to figure out what to do with them. I found a great island-style hot sauce recipe that I’ve tweaked after 3 batches. here it is below! I wear gloves and goggles when handling the peppers. I learned the hard way after not doing so and removing my contact lenses after washing hands 4 hours later!